Hello! I recently came across this great article on Yahoo! that talks about foods that improve hair health. I’ve always had really great long thick hair, but back when I was a vegan, I noticed that my hair was getting thinner and didn’t seem as healthy (which is one of the reasons I’m not a vegan anymore). So, I was excited to see this article, as this is an interesting topic for me (and I thought it would be for you too)! (1) Eat more Omega 3 fatty acids to make your hair shine – You can get omega 3 from fish, nuts, or flax seeds. If you choose to eat flax seeds make sure you grind them up first or else you won’t be able to digest them. Omega 3 fatty acids also come in pill form (aka fish oil), although I personally think it is always better to get nutrients from their natural source whenever possible. (2) Vitamin B -- B complex vitamins can be found in foods like potatoes, bananas, milk, meat, eggs, cheese, & peas. B vitamins are believed to encourage cell growth, including hair growth! (3) Avocado - One of my personal favorites! Check out my recent posting on an avocado smoothie, or eat avocados in your low calorie sandwiches, low calorie quesadillas, or guacamole. (4) Stay away from animal fat if you think you are losing hair -- It is believed that animal fat may promote hair damage. Worth keeping an eye on if you are concerned about your hair health. (5) Make sure you are getting enough iron - Foods like chicken, eggs, nuts, and dark green vegetables contain iron. By the way, iron levels can be depleted by tea and coffee. An iron deficiency could lead to hair thinning. (6) Eat healthy proteins -- hair is made out of protein! The article mentions that fish is a great choice, but definitely eat all the proteins you like, including tofu, nuts, beans, lean meats, eggs, and dairy. The article also has two great tips in it: (1) Wash your hair with diluted apple cider vinegar (I'm going to try this over the weekend -- the vinegar supposedly helps wash away some of the residual crud that makes our hair dirty) and (2) be aware that certain kinds of dieting (like losing pounds quickly) can affect your hair health. oh. I get a lotlotlot of omega3's and 6's but perhaps I need avocado? Awesome! I love this post! Interesting note about the animal fat! Eek! Ah ha! I guess my lurve of avocados is not so bad after all! thanks for the great post! Well that's confusing about animal fat. It says to increase protein with chicken, fish, eggs, etc... but animal fat actually can damage your hair? I hope that's only talking about things like pork and beef.. fattier cuts. Chicken and turkey breast is okay? Too bad I don't like avocado! interesting! I just made some quick quac last night. 1 avocado, squeeze of cilantro paste, splash of lime juice, sprinkle of salt. I usually like lots more "stuff" in it, but this is simple and quick! this is a really interesting article. when i first became vegan, i was very dizzy all the time and couldn't concentrate because i wasn't getting enough fats in my diet. avocado was one of the foods that i started to eat. i'd make guacamole like crazy. This is a great post and site. 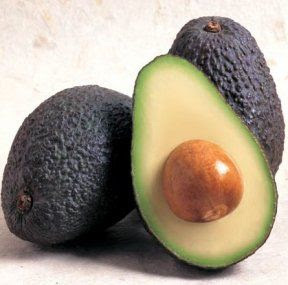 When I was young and growing up in Africa, we used to put mashed avocado into our hair as a conditioner and it was excellent for healthy shiny hair. Mizfit: Maybe try the apple cider vinegar? Kiran: I can't believe you put avocado in your hair! That is so cool! I love avocado! Thanks for the info! When you have 2 tress, and more fruit then you can eat, you use it for beauty treatments. All fruit rubbed on to your skin is good, you just have to know what is good for your skin type.